Four victims were taken to Hartford Hospital with non-life-threatening injuries. Three people were rescued by passing witnesses when fire broke out at home on Cottage Grove Road in Bloomfield Tuesday. Three people were rescued by passing witnesses when fire broke out at home in Bloomfield Tuesday. Crews responded to a home on Cottage Grove Road in Bloomfield Tuesday evening. 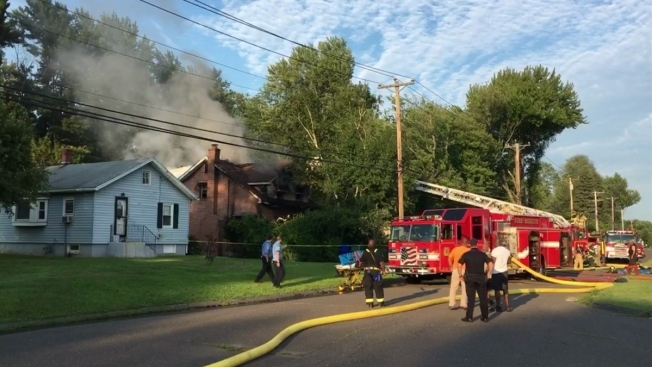 Fire officials said three people inside the house were rescued by two people passing by – a retired Hartford firefighter and a Plainville firefighter. A fourth person escaped the home under their own power. All four victims were taken to Hartford Hospital with non-life-threatening injuries. Fire officials said the fire was difficult to knock down because it spread rapidly.